Much as he considered himself a philosopher, Morris Raphael Cohen was also immersed in the machinery of social life. From his first years of "engagement" as a volunteer teacher in Thomas Davidson's school for working-class people, to his last as professor of philosophy at New York's City College and at the University of Chicago, he constantly sought to understand the underlying assumptions of human behavior.The studies Cohen gathered together for Reflections of a Wondering Jew are an indication of representative achievements of his life. He was deeply involved in the experience of the American Jewish community, and much of his work here consists of an inquiry into and analysis of specifically Jewish affairs. Some of his most valuable contributions to American thought and maturity are those that were never included in standard philosophical efforts. His work and scholarship provide foundations for the field of human problems and the history of ideas. 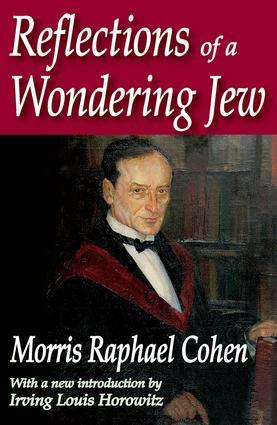 These lectures illuminated the way forward in so many of our crisis years.There is a certain tragedy to the fact that for many decades Morris Raphael Cohen had hoped to organize and put into systematic form his literary reflections on Jewish problems and American liberalism. Towards the end of his life, he faced the realization that many of his intended writings would never reach fruition. Though this volume may not be quite what Cohen intended, it is a product of a mature giant in American intellectual history.